One of the nice things about technology is that it makes spreading theology a whole lot faster and easier. In this post I’m going to introduce you to 4 Bible programs. Two are for PC users and two are for Mac users. Although there are a whole bunch of Bible programs, I’ve selected four that I use which so happen to be free. I’ll let you know about a couple of Bible programs, that I also use, that are not free, on another day. 1. E-Sword.net. This is a Bible program that’s good and has lots of information. It has everything you need to effectively start a good study of the scriptures. The default version comes in King James Version w/ Strong’s numbers and Strong’s dictionary. Not bad at all. 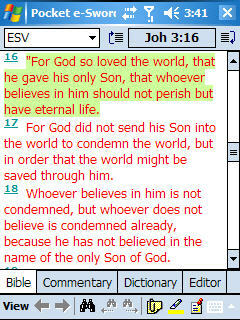 You can download any or all 16 different versions of the Bible in English at no cost. They also provide the Bible in several different languages. Optional free downloads for E-sword include; commentaries, dictionaries, graphics, devotionals and Christian classic books (like Fox’s Book of Martyrs by John Fox, Systematic Theology by Charles G. Finney, and The Pursuit of God by A. W. Tozer to name a few). I really like E-sword’s search capabilities, the ability to view up to four version of a verse at the same time but especially its easy to use. The best part is that you get all this free. E-Sword stands up to several other Bible software that can cost you hundreds of dollars. E-Sword is also available for Pocket PC users! So if you’re on the go, that the Bible with you. With Pocket e-Sword you have access to the same volume of scholarship within seconds, (just like the PC Desktop version) any time and anywhere! You can have several versions of the Bible, commentaries, dictionaries & devotionals with you all the time. Click here to download a copy. 2. There’s another very nice free Bible program for PC users called, InstaVerse. It’s available at: http://instaverse.com/. I find it very useful. It’s really more like an assistant. When you type a scripture or your mouse pointer passes over a scripture the complete Bible verse appears in a small pop-up window. This is very convenient. You don’t have to stop what you’re doing and look up the verse, it’s just right there. I wrote about this one previously. Click here to check it out. 3. For a free Bible program for Mac’s let me introduce you to MacSword. MacSword is a free & open-source application for research and study of God and His Word. It is developed specifically for Macintosh computers running Mac OS X.
MacSword allows you to read and browse many different bibles translations in different languages from Hebrew to Albanian. As well as reading devotionals, commentaries, dictionaries and lexicons, it also supports searching and advanced features such as services so that you can access the Bible in any program. And because MacSword is based on the Sword project, it is compatible with a growing collection of over 200 texts available in over 50 languages. 4. Mac users can also use a cool little widget called, Logos Bible Widget. Look up any Bible verse on your Mac instantly! Simply type or cut and paste any scripture reference into the Logos Bible Widget and instantly see the entire verse. Easier than grabbing your Bible off the shelf, faster than going to Bible Gateway, and best of all – it’s free! What’s new in this version of Logos Bible Widget is the addition of the ESV Bible. That’s very nice! If you’re not at your computer and want to read the Bible, read it on your cell phone. I wrote about this previously here, here and here. Let me know what you think. Here’s an inspirational message giving by a young man (Randy Pausch) giving his last lecture. What you you say if you had this opportunity? Ever needed to copy something interesting from a web site (a picture, text, web site address) but don’t have a pen and you don’t want to email it to yourself plus you’re in a hurry? In the past, I would have opened the notepad application and paste everything I need to it (except photos), then save the file. If I was not using my computer I would have to email this note to myself. Although I was able to do all this very quickly, I no longer have to go through this process anymore. 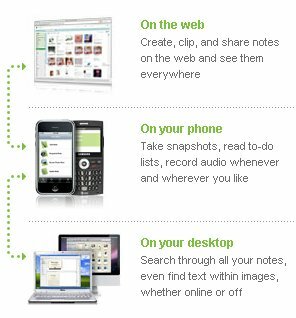 I now use Evernote.com It’s the most important free little program that I use on my PC. It also works on my Mac and on my PDA. It helps me to quickly copy text, photos, urls, jot down notes, etc. The best part is that it synchronizes all of this info online. All of this info is always available to me from however I choose to access it (on my phone, on the web, or on my desktop). It even has a special app. for the iphone. Here’s a short introduction to Evernote. The next time you’re reading a cool devotion, see a good scripture, or just need to write down that inspired thought of yours, copy it to Evernote.com. It’ll always be there. Imagine having access to several of your sermons outlines, bible studies, devotions, etc. from any computer you’re working on. Now stop imagining and copy those bad boys to Evernote.com. This service is especially useful if you use several computers and always need access to your data. Just log into your free account and it’s all there. Receive our articles free by email, just enter your email address below. Here’s a free ebook by Hank Hanegraaff, president of the Christian Research Institute, entitled, “Answering Athiests, What Every Christian Should Know“. His daily radio program helps to equip believers defend their faith against errors and false teachers. * Are the Bible manuscripts reliable? * Does the Bible promote slavery? * Is there evidence for life after death? * If Christianity is true, why are so many atrocities committed in the name of Christ? * Is the Big Bang biblical? * Is Intelligent Design really a choice? …and a whole bunch more. Oneplace.com also has a huge selection of question and answers called, Biblical Answers to Life Questions here. Check them out. Both of these resources can come in handy for Bible study, group discussion, for individual reference but mostly to be able to answer some of the tough questions that are many times asked of us. If you enjoyed this post you may also like this one, “Dad, I’m not sure I believe in God anymore” also stop by and visit, “Biblical Answers to Life’s Questions” here. A podcast is an audio or video file that is distributed over the internet. A podcast is like a radio show that you download to your computer. The best part is that you can listen to them anytime you want. You can play podcasts directly from your computer (PC or Mac) or transfer them to your iPod or any mp3 player. What’s really nice about podcasts is that they are grouped into channels just like every radio show is listed on a radio station’s channel. People can easily subscribe to podcast channels which allows your computer to automatically check to see if any new podcasts are available. If they are available, they are downloaded for you. You don’t have to keep checking to see if a new podcast is available. Now you can learn how to make podcasts of your church sermons, discipleships, meetings, services, etc. with “Podcasting Made Easy“. Broken down into easy to understand terms, this 24 page full-color report will teach you all you need to know about podcasting. What it is, how to easily create them and begin profiting from this technology. Podcasting is very simple for even the beginning computer user. In fact, there’s… No hard-to-understand “techie” hardware or software to buy. No special license or training to fight for (like regular radio broadcasts require). Little to no money needed to get started and a very small learning curve (you’ll be up and running in no time). Podcasting is like making a radio broadcast to the world. Except for you only have to record your voice once (at any time you want) and let listeners find your podcast on the web to listen to (at any time they want)! You Don’t Have To Be A Recording Artist Or Computer Expert To Produce Your Own Podcast! “Podcasting Made Easy” is ready for you right now (by instant download). Click here to get started. Here’s a service which definitely gets my “two thumbs up”. Pandora.com is an Internet Radio program that creates music playlists based on an artist of your choosing. The best part is that it’s absolutely Free. Pandora.com provides endless new music and is extremely easy to use. The first thing you do is to type in the name of any of you r favorite artists, songs or classical composers. Pandora then quickly being playing their music and then continues to play music from similar artists and songs of similar styles. Pandora calls this creating a station. You get a seemingly endless playlist. It’s great! While the songs are playing, you have the option to rate the song you are listening to, bookmark the song or artist, create a new station, purchase music, and look up more information on the artist or song you are listening to from Pandora’s database. I started with Kirk Franklin, Pandora then gave me music from Fred Hammond, J. Moss, Donnie McClurkin, and whole bunch of my favorites artists. After a while I clicked on “create a new station” and entered Chris Tomlin. Pandora did an excellent job of introducing me to Third Day, Caedmon’s Call, Lenny Leblanc, Casting Crowns and several others. There were a few songs I didn’t like so I just skipped to the next song. I now have 2 playlists, (or stations) one for fast praise music and another for slow worship. Pandora lets you create up to 100 stations, WOW! Since I created a free account, which took only about 1 minute, I now can log in anytime, from any computer with internet access and select either my fast or slow radio playlist. Pretty cool stuff, don’t you think? If you have a good stereo at home, connect an FM Transmitter to your computer, tune your radio to it and whoala! you got your your favorite Christian music streaming to your entire house. This will work in your home, office, church and even in your car. For details click here. Pandora radio also works on the iPhone. Just start with the name of one of your favorite artists, songs or classical composers and Pandora will create a “station” that plays music by this genre and more music like it. Pandora on the iPhone is fully integrated with Pandora on the web. Enjoy all your existing stations – and create new ones right from your iPhone or iPod Touch.